One night last week while we were on vacation I listened to Carissa (age 4) say her bedtime prayer. She talks about lots of random stuff in her prayers, and includes some things that I think she must hear at church, but her prayers usually give me some idea of what’s happening in her life and head. When she finished I told her that while her prayer was very thoughtful and kind, Down syndrome isn’t like being sick, and Wes would have Down syndrome for as long as he lived. I explained again and thought about where this prayer may have come from. 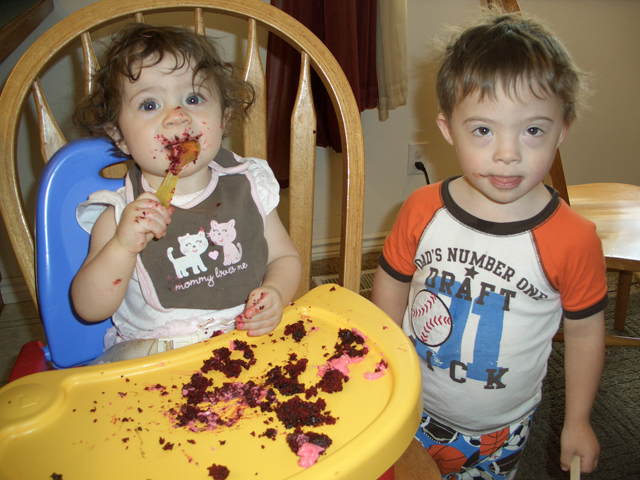 Occasionally when Wes is having a hard time with something, like with behavior or understanding, Carissa will ask about it and sometimes we tell her that Wes has a hard time with this or that because he has Down syndrome. We want her to know he has Down syndrome. 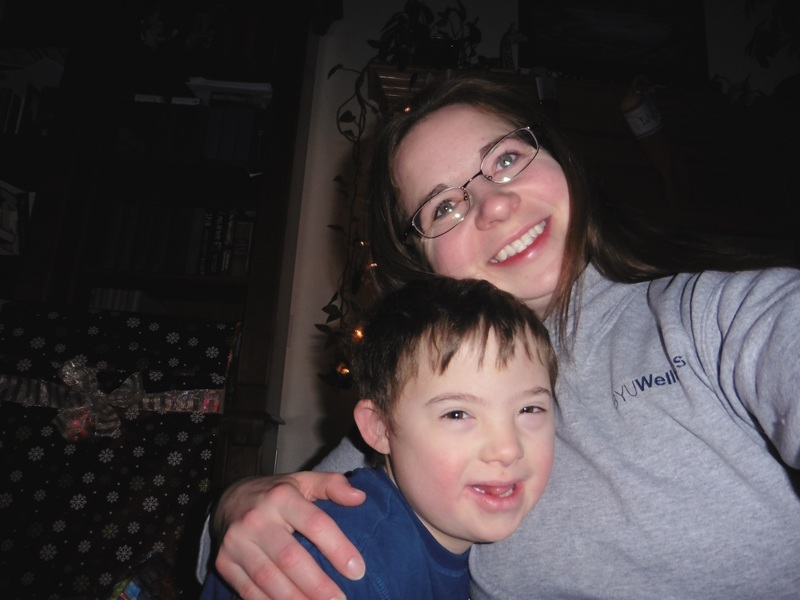 She seems to understand it in its most basic form, which is that Wes does things sometimes that seem different or wrong because of Down syndrome. 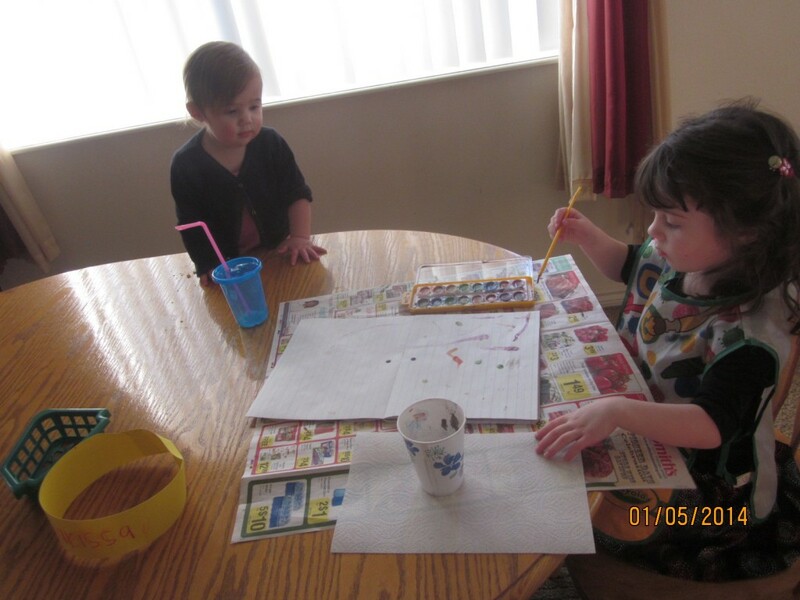 I think she maybe was thinking that this would be something he’d outgrow, like age-related behaviors, the way we tell her that her little sister won’t be a baby forever and do those baby-type things that make her mad. We haven’t talked much in our family about death and what happens after that, but I tried to tell her that after Wes dies and is resurrected (which I’m pretty sure she doesn’t have any clue about, but I threw it out there anyway) his body would be perfect and then he wouldn’t have Down syndrome anymore. I know she didn’t get it. I told her we’ll have a Family Home Evening lesson about it sometime. 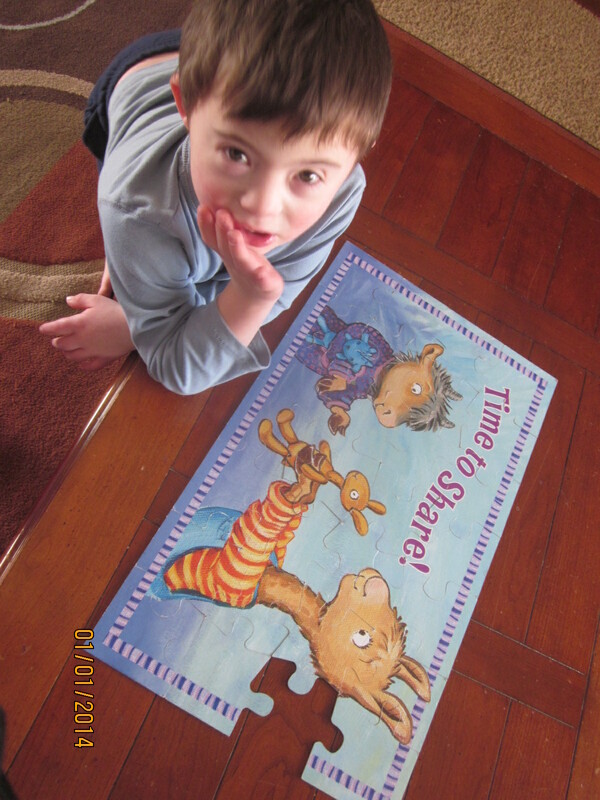 Clearly we have more to teach and more to learn together about Wesley and about Down syndrome in our family. 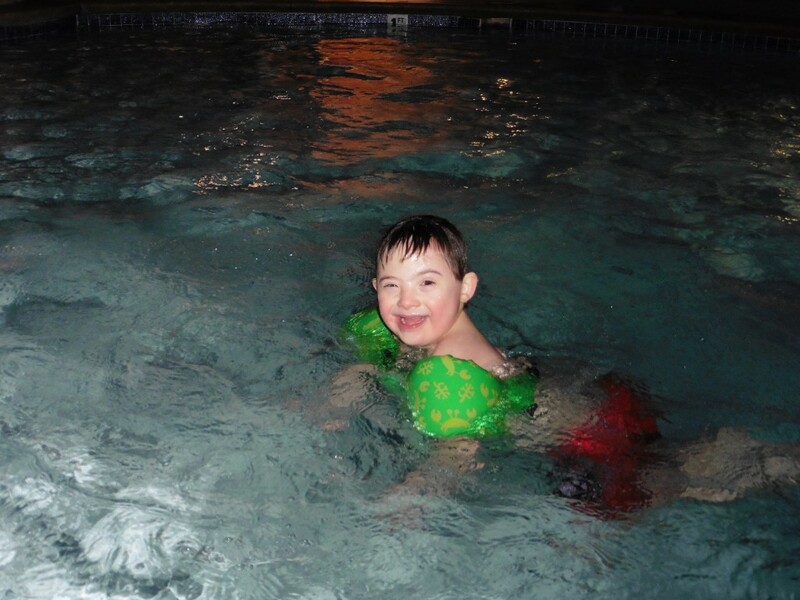 Wes is WES–more than his body, and more than the limitations placed on his body and mind that come from one pesky, extra chromosome. I wonder sometimes and try to imagine what it will be like to live with him in the eternities, when he is freed from these limitations and gets to understand things fully, express himself fully, and experience the fullness of joy that comes from having a family of his own. Talk about perspective. If only I could remember all this when Wes is flopped on the ground in a store and refuses to get up and I can’t lift him. Or when he runs away in a public place and I’m yelling for him to stop and chasing him at top speed while everyone watches. Or when I’m talking yet again to his teacher/speech therapist/behavior therapist/resource teacher/school psychologist/principal/etc about ways to help him do better at school. Or when we tell him something for the umpteenth time and he still doesn’t do it or get it. Talk about frustrating. The honest truth is that I often feel weary. It is a tiring and heavy and difficult job in a way that is impossible to explain or justify in words. Should I even admit that helping my son makes me weary? Can I do that and still be a good mom? Should I do that when I know other parents deal with so much more? Some days it is a struggle to find balance between 1) handling the challenges that are daily and ongoing and in some cases getting harder, and 2) recognizing and collecting and savoring and then remembering the very precious elements that make up this very precious person who is (I am so lucky) my son. 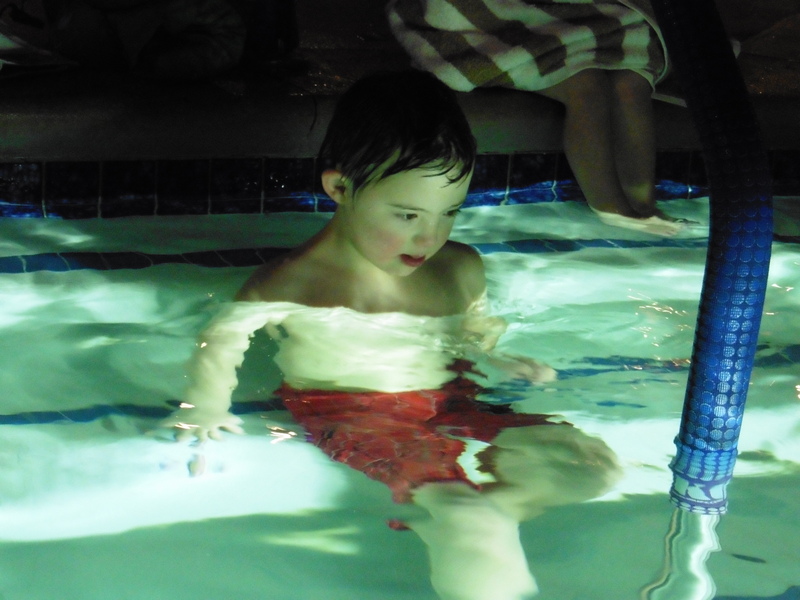 I have heard several theories from others about why Wes and others like him may have Down syndrome, or a myriad of other types of disabilities or challenges. The only one that I really believe in is this one: He gives me opportunity to learn. To learn patience, to learn love, to learn compassion, to learn acceptance, to learn joy, to learn sorrow, to learn faith. I have so much to learn and I hope I have so many more days with Wes to help me continue to do so. I have much to learn. Today I work on perspective. 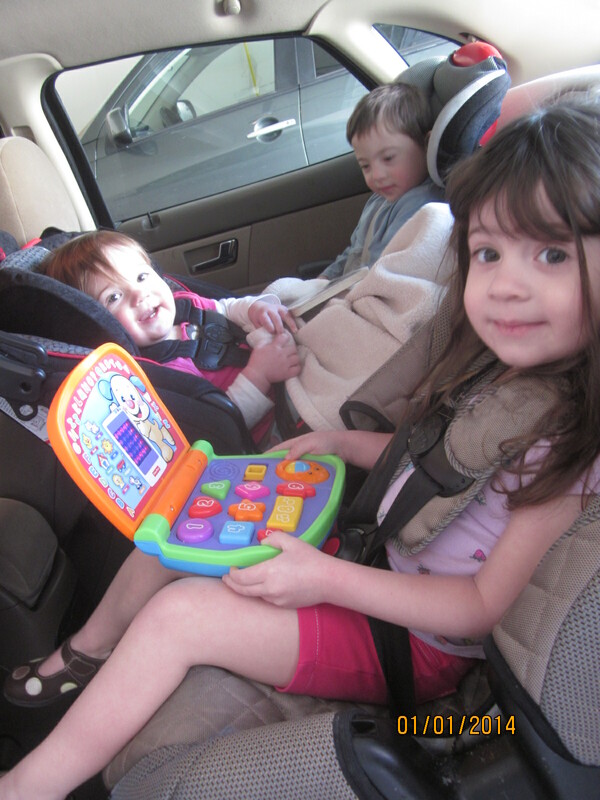 Baby Elizabeth needed a bigger car seat since she’s outgrown her infant-size one. Since all three seats have to fit across the back of my car, I researched narrow car seats, but they are so darn expensive I finally just bought a regular-sized convertible car seat from our local Costco for much cheaper that I knew I could easily return if it didn’t fit. It fit! Barely. After a bunch of hours of frustration trying to install the new rear-facing seat myself (reading and re-reading the owner’s manual, looking up videos and reading reviews online) but still not getting it right, I called the county car seat specialist and scheduled an appointment for a car seat check. The lady spent 45 minutes checking each seat, making sure they were installed properly and adjusted to fit my kids’ height. Good thing we went in; the only way to get the new rear-facing seat to sit at the proper angle involved wrapping cut-up pool noodles in a towel and stuffing them under the seat. And now we’re good to go until someone else outgrows a seat. We went grocery shopping. This can be a lot of work. 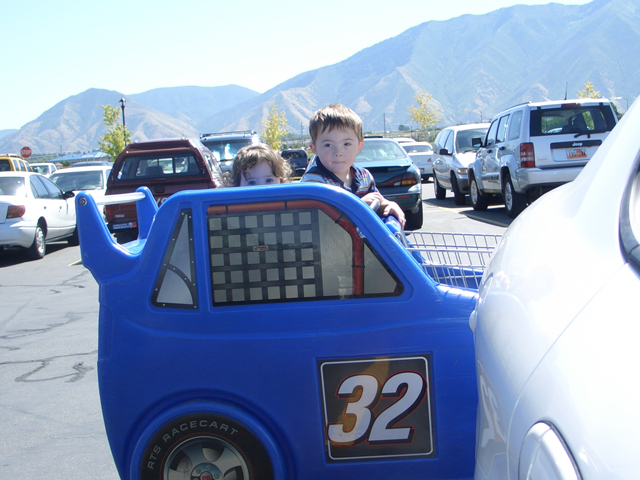 Carissa likes the carts with a mini-car in the front that she can ride in. 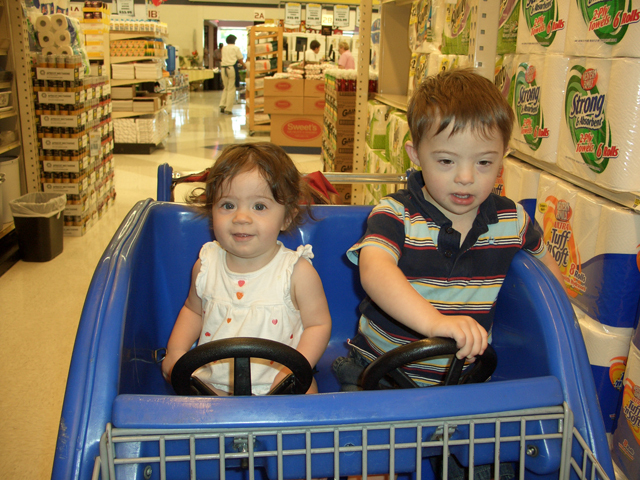 She sits in that (buckles herself in, so she’s safe), Elizabeth sits in the cart seat up by me, and this time for Wes, I gave him his own mini-cart to push around and load with groceries so he could help. But he ended up riding it like a scooter all over the store and I spent a lot of time chasing him down and pulling him back by me. And he ate a big bite out of a head of broccoli and so we bought it. 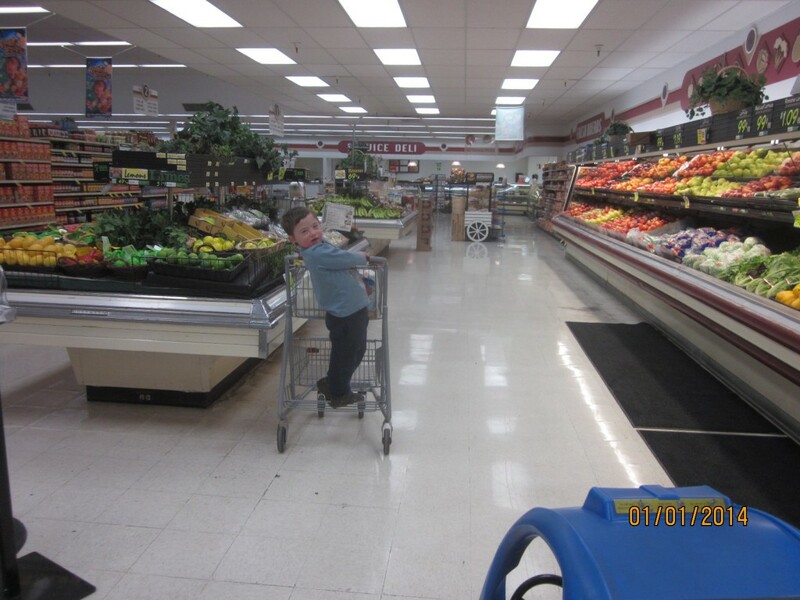 He does this almost every time I let him near produce in the grocery store. Carissa likes to wear this special hat. Sometimes it’s a swim hat to keep her safe from sharks. 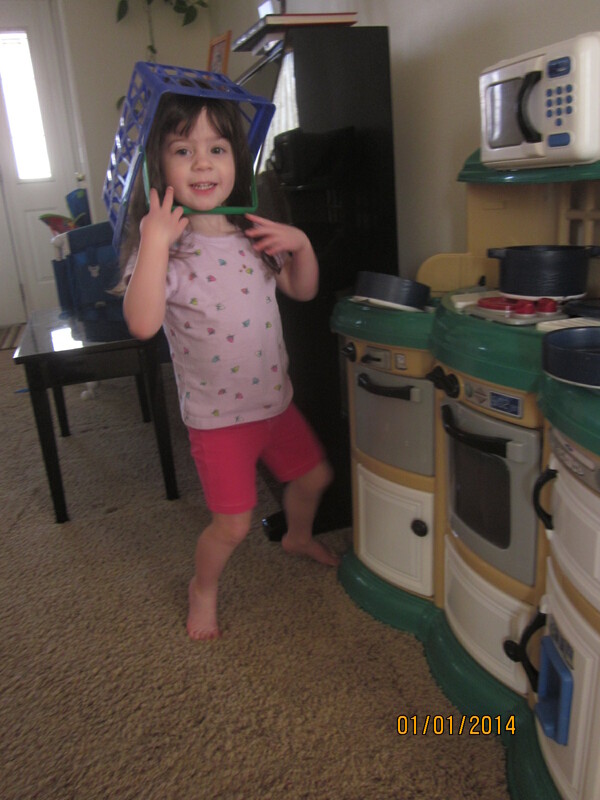 Today it was a cooking hat to keep her safe from…I don’t know, something related to cooking. 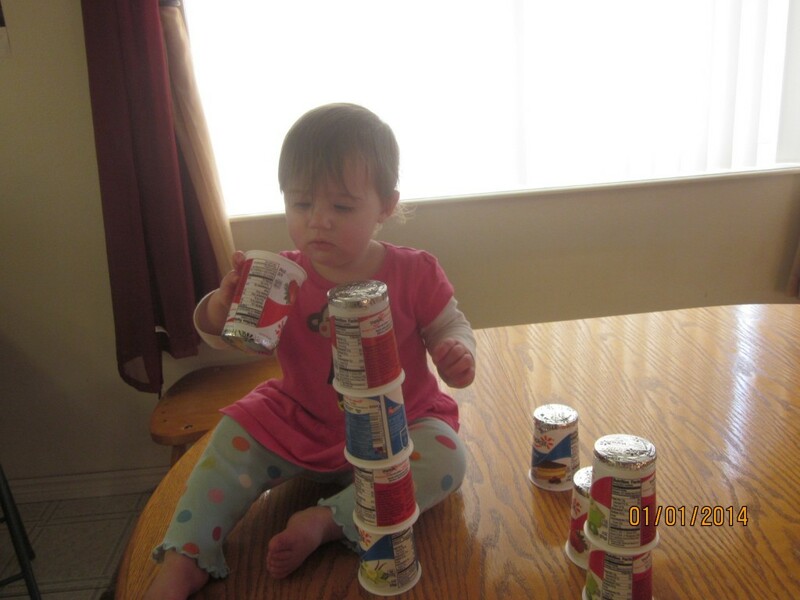 I shouldn’t have let Elizabeth build towers out of Yoplait, because several ended up broken on the floor. But oh well. This is still Wes’s favorite puzzle. He builds and rebuilds it all day long, every day. There is one stubborn piece missing and I don’t know where to find it. This stinker is into everything and climbing onto everything. 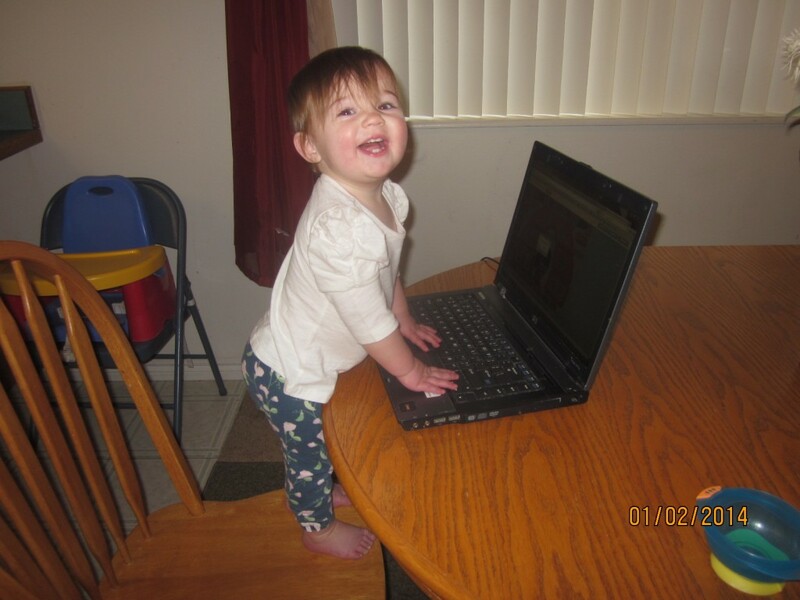 Such as climbing chairs to reach my laptop or get onto the table. We try to keep the chairs pushed in as far as possible. 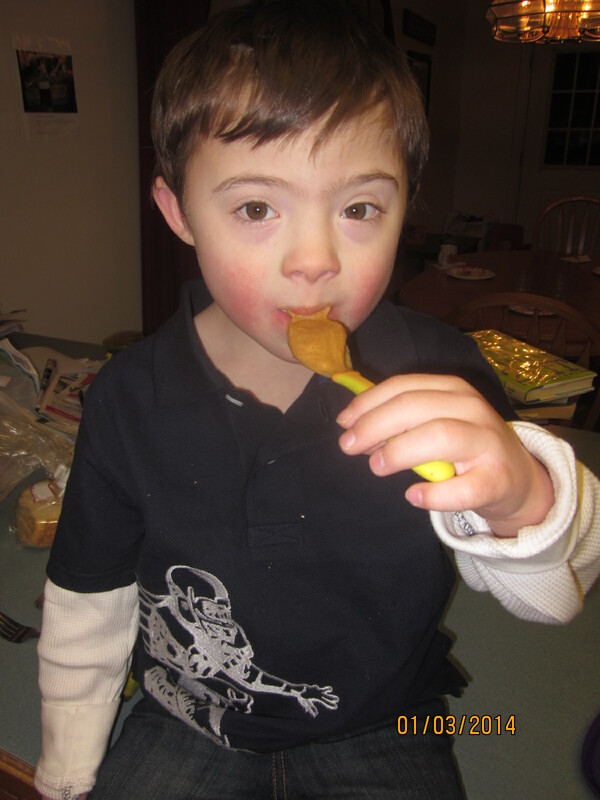 Wes liked peanut butter, just like me. John blames this on me, and also Wes’s propensity for ice cream, but Wes also really likes chocolate and I blame that on John. 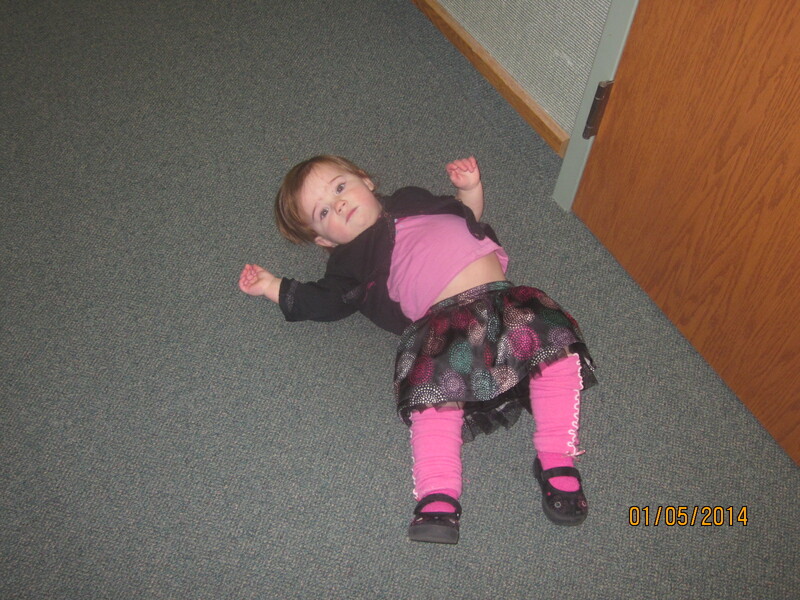 Our new early morning church schedule is a challenge for the baby, who usually naps during this time. 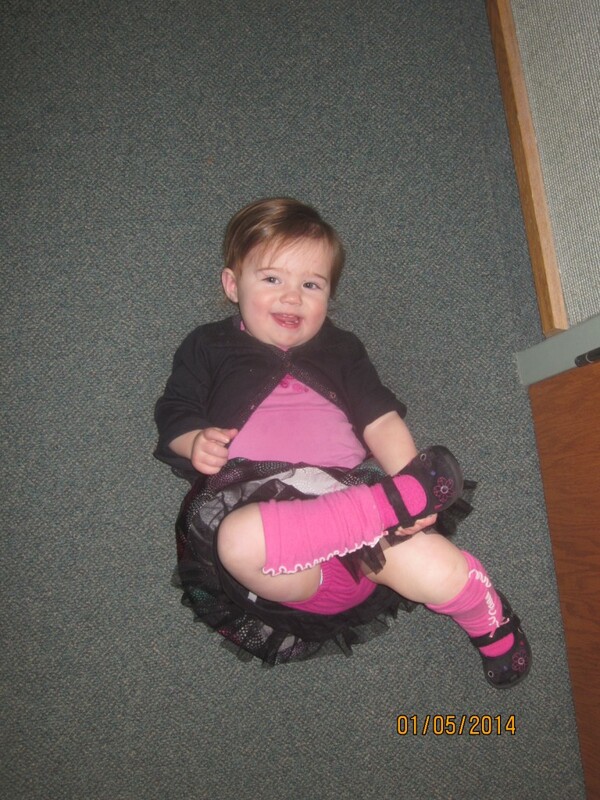 She was really good overall today, but still couldn’t keep herself from hitting the floor near the end. 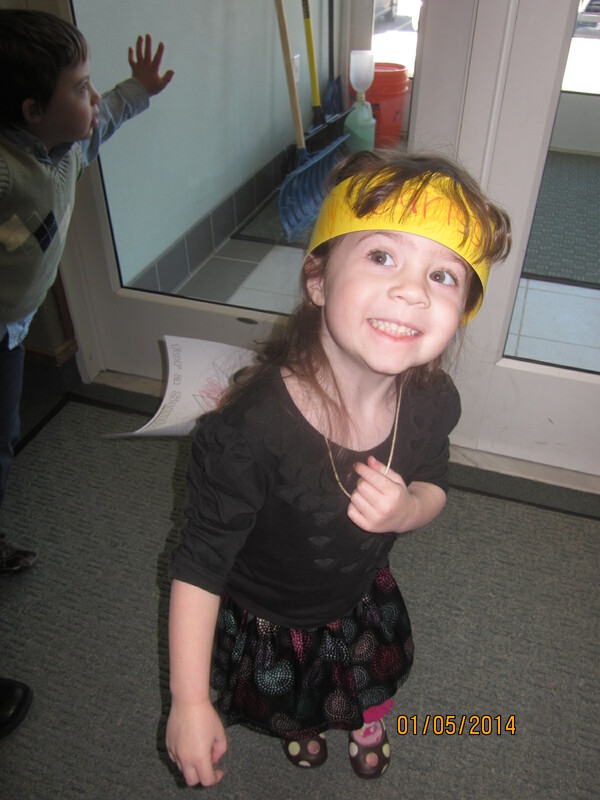 Our three-year-old is the newest member of the Primary program in the Sunbeam class. Today was her first day. 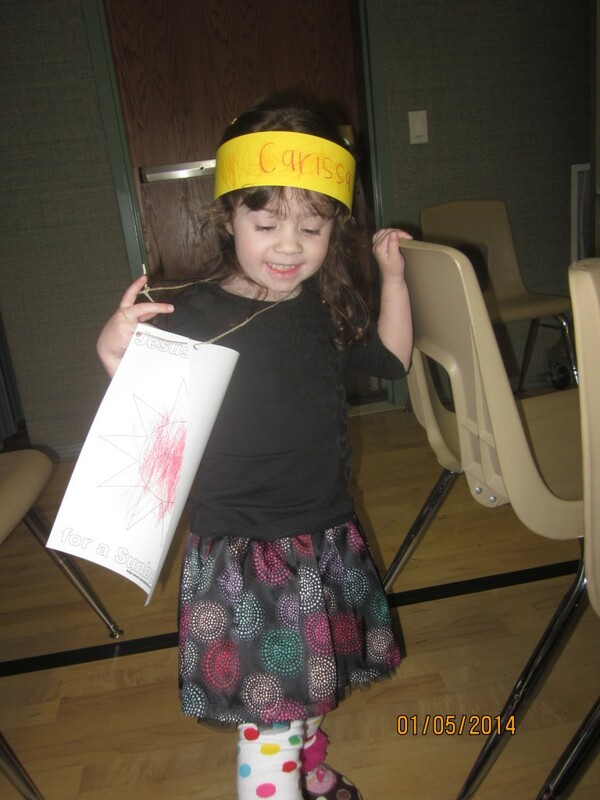 She brought home a crown and a necklace with a picture of the sun, and she did really well. 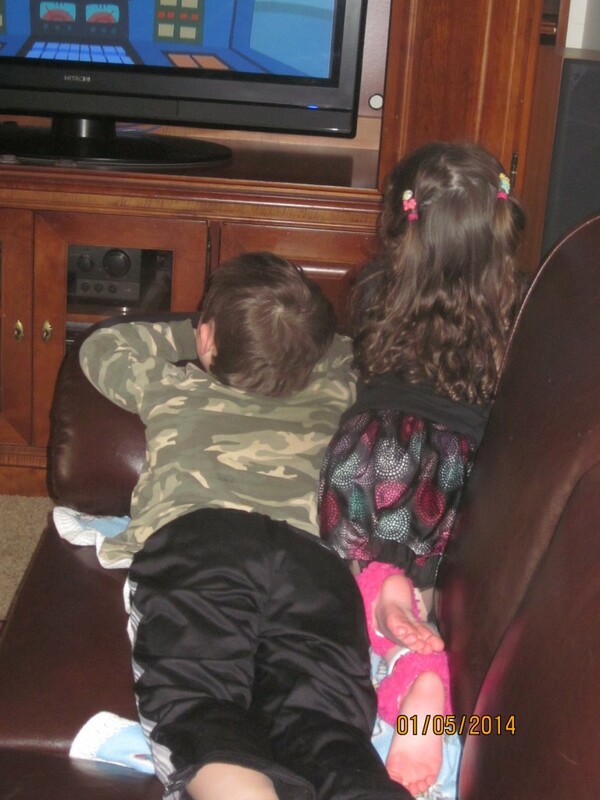 I like watching Wes and Carissa on the couch together. Carissa artisting and and Elizabeth watching. 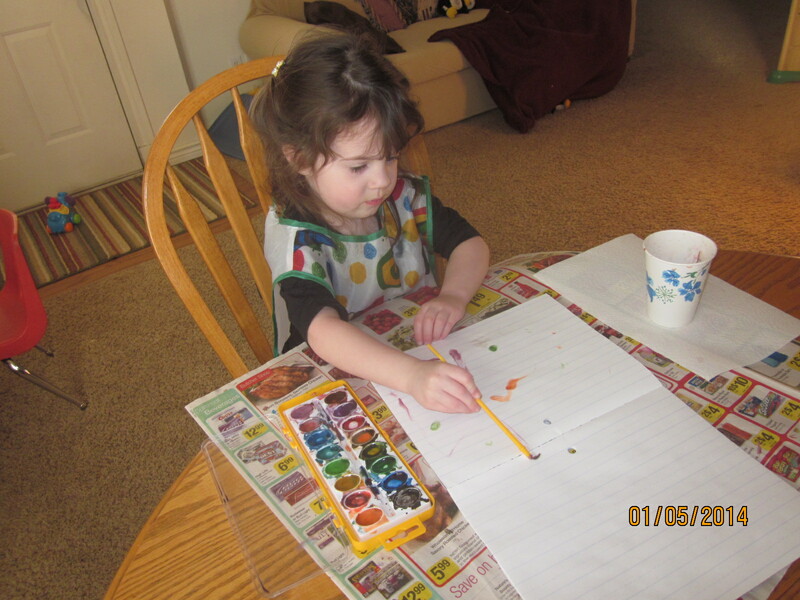 Captured two seconds before she got her fingers into the watercolor paint. Wes turned four in September, but I was a little slow getting him in to the doctor for his well-child check and just went last week. Wes weighs 32.8 lbs and is 37 inches tall. He’s grown about 6 inches in the last year. On the “typical” child chart he’s in the about 1.3 percentile for height and weight. 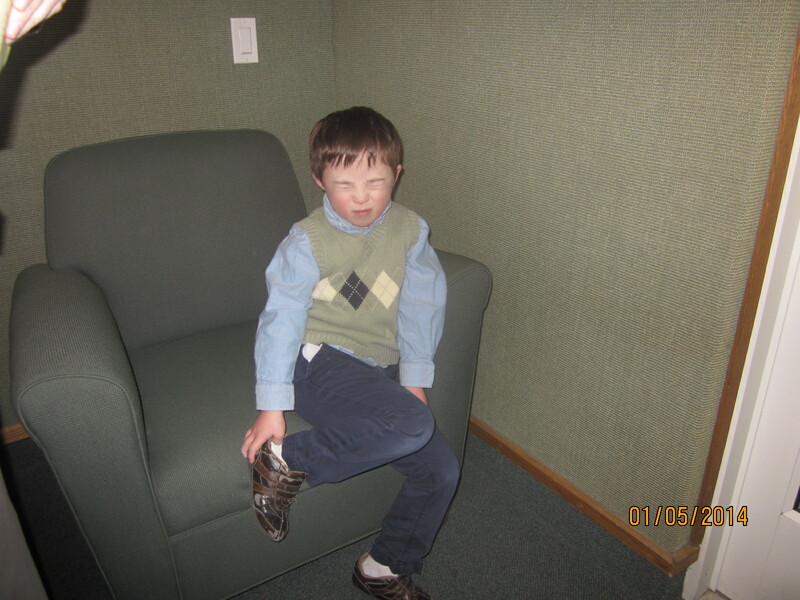 On the Down syndrome chart he’s closer to 60 or 70 percentile. His BMI is actually in the 70 or 80 percentile. So he’s doing fine. I read an article recently that said that about 92% of pregnancies that test positive for Down syndrome are aborted. I have a really hard time understanding why any person would want to remove life from her body. 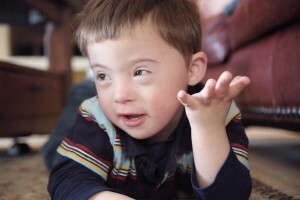 I find it especially sad to think that parents who could potentially love and find joy in their child deny their child life because they’re afraid and ignorant about what it’s like to raise a child with a condition like Down syndrome. 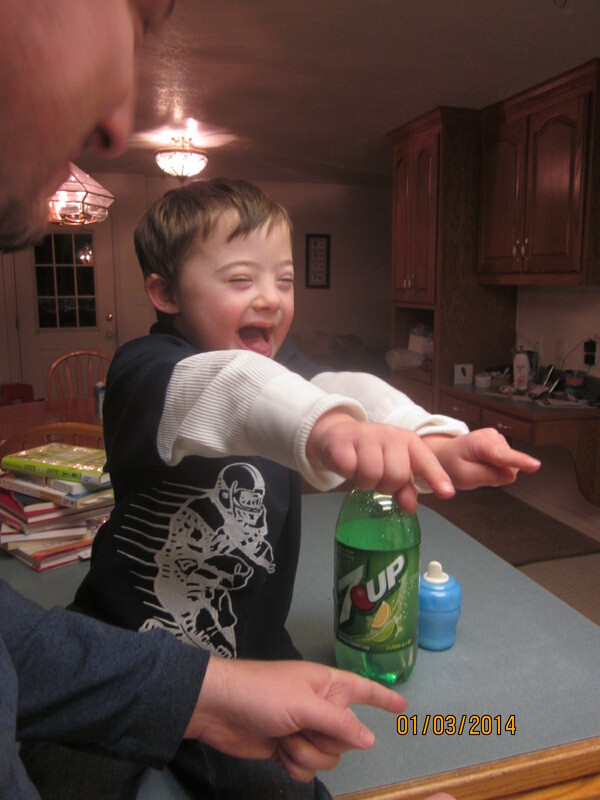 I’ve talked with a lot of moms in my county who have children with Down syndrome. 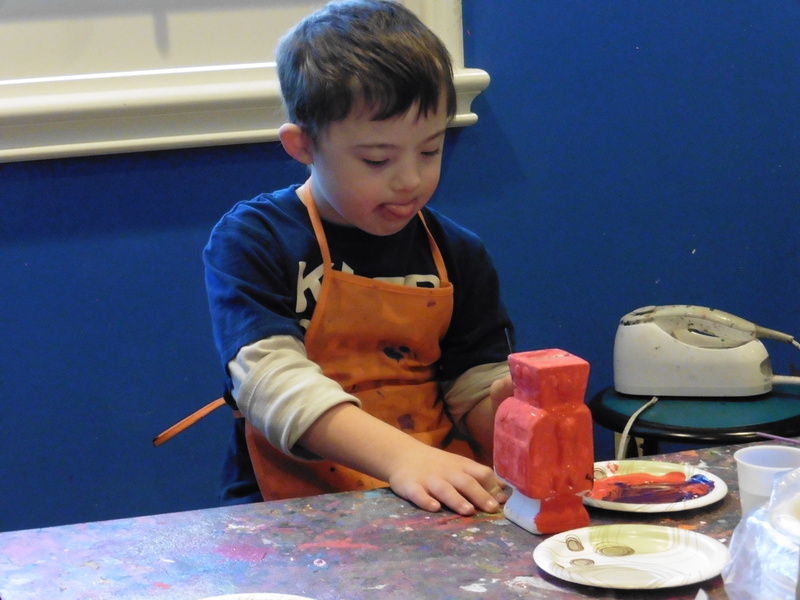 All of our kids have unique challenges associated with the extra chromosome. 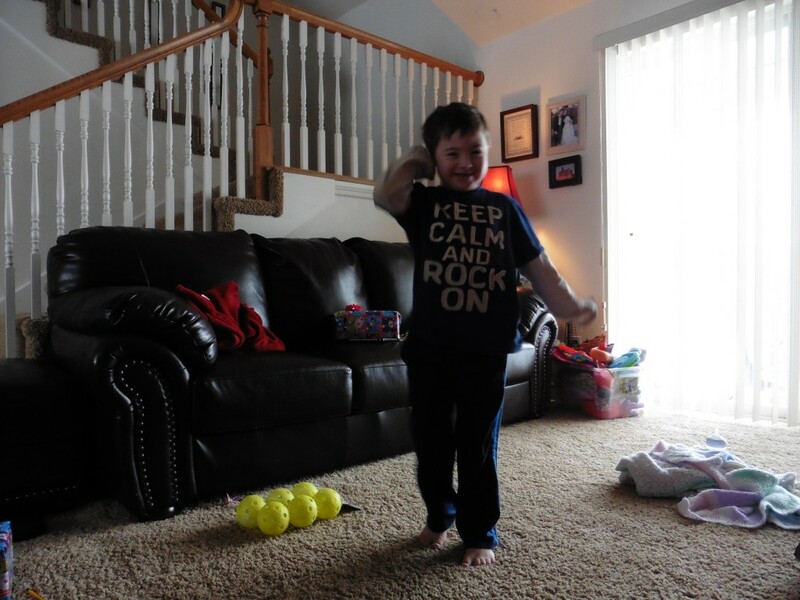 Many kids have more severe medical concerns than Wes has experienced. But even parents who have dealt with heart surgeries, sleep apnea, leukemia (and the list could go on) love their kids and think their kids have worth, regardless of the challenges involved with caring for them. If people could just understand what they’re giving up when they either abort their baby or give it up for adoption (which is common in other countries; children with disabilities are considered undesirable). I don’t understand it. John says it’s because I have a good heart, and that maybe it’s better that I don’t always understand why other people do what they do. I think it’s just because every day I get to watch Wes live and see how much he loves to live. I don’t worry about Wesley’s happiness. I don’t worry about his success. I only worry that he’ll find as much love and acceptance from others as he has for everyone else. It makes me think that kids who are as innocent and full of love as Wes are really made for a better kind of world than we can offer them. 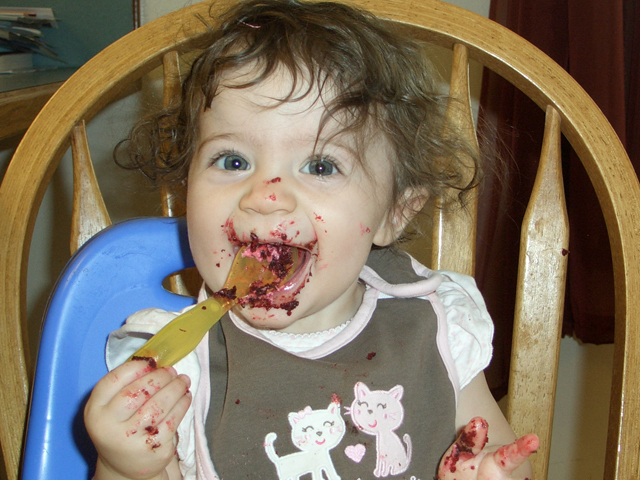 Carissa turned one last month on August 15th. 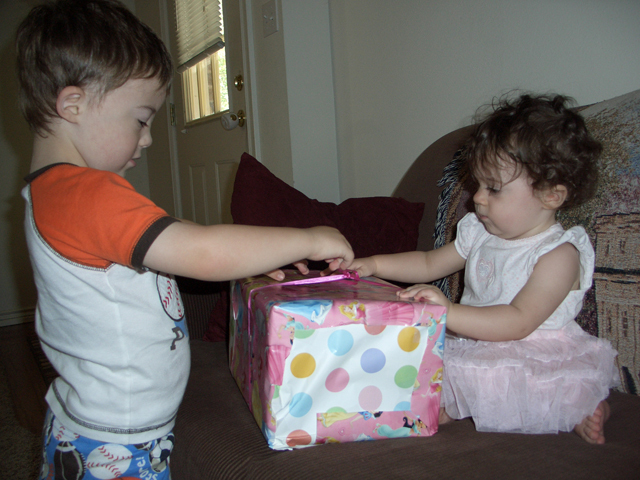 Speaking of birthdays… Four years ago at this time I was deep in labor and didn’t even realize it. John and I were just starting to think that maybe this could be it, but I was only 36 weeks pregnant, didn’t have a hospital bag packed, and in fact didn’t even know where the hospital was. But we threw a bag together, sped off and found the hospital by about 11 pm, and Wesley John came quickly into the world a little after 1:30 am weighing 3 lbs 15 oz. My last night with a three-year-old son. Wes is learning how to use the garbage can. He used to think the big trash can was meant for him to empty out. Which is why for months our kitchen trash can sat on a countertop. But recently I’d had enough of it sitting on the counter so I put it back in its place on the floor and determined to teach Wes how to leave it alone. He’s getting better. If he throws his food on the floor (something else we’re working on–with no progress yet) I ask him to put it in the garbage. He’ll walk over, lift the lid, throw the item away, then close the lid and pat it like a dog. I’m always really happy to see him use the trash can like a big boy. Although today he was a little too much of a big boy when I caught him lifting the lid and throwing away a $2,200 check I need to take to the bank. Thankfully I grabbed it before it went the way of all the earth. 1. Wes has been sick, it feels like non-stop, since about Christmas. But in reality it comes and goes. Last week it really came and he had a fever five days in a row. 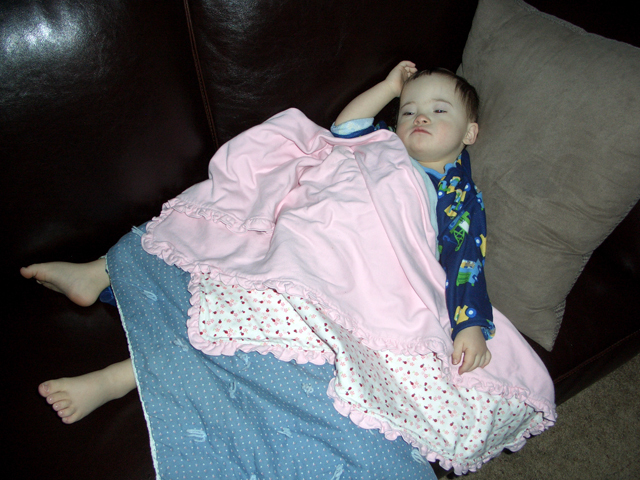 He would wake up totally fine, then get a fever and become listless around 3 or 4 in the afternoon. The next morning, he’d wake up and be fine…until the fever came again. On the fifth day he woke up with a fever, so I finally took him to a doctor. The doctor couldn’t pinpoint the trouble, except to say that Wes had a very mild ear infection in one ear (not really enough to cause 5 days of fevers, though). Wes is on an antibiotic and he is doing much better this week. 2. Wes got a trampoline (on loan from his therapists). He’s been trying to jump for weeks and this is great for him to practice on. When it first came he wouldn’t go near it. Eventually he ventured on top to test the buttons. Then, finally, he started to bounce. Eventually he started to full-out jump. 3. Wes can climb into his booster seat all by himself. 4. He can also do dishes. This is a long video. 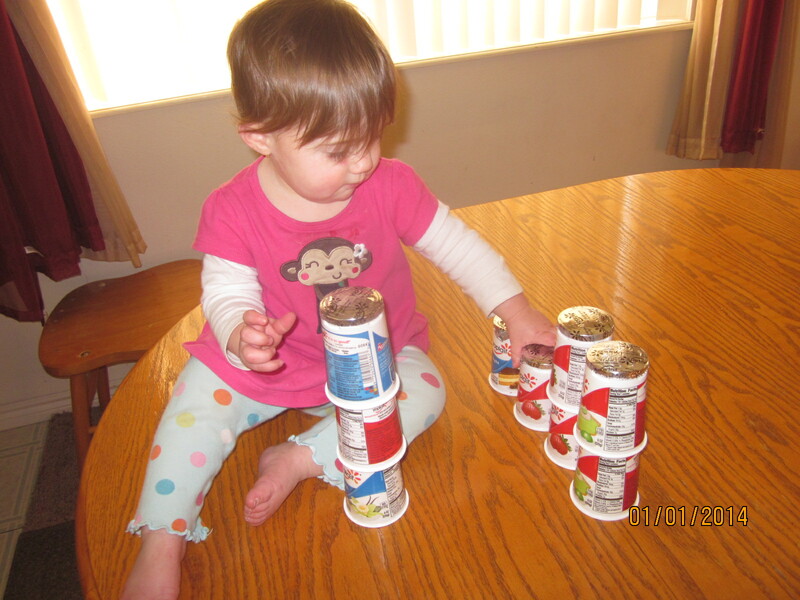 He likes to stack things, whether it’s toys, crayons, dishes, whatever. He’s very organized. 5. He still likes to dance. 6. 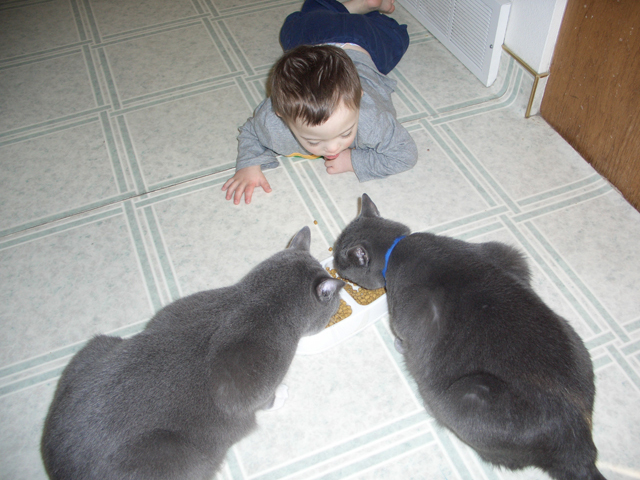 Wes loves our two cats. They usually eat in the basement, but now and again I’ll feed them upstairs because Wes likes to watch them eat. Sometimes he flips their food dish upside down while they’re eating, which causes him to end up in the Bad Boy Chair and gives me a chance to learn how to discipline. 7. I’m still teaching Zumba and aerobics. I love it and learn a lot. One of my aerobic idols, Kathy Smith, said, “The more you get out of your comfort zone, the bigger your comfort zone becomes.” I’m finding this true as some of my current classes are more challenging to teach than others. Here I am with three other local Zumba instructors at a recent Zumba benefit that we all taught at. 8. We’re going on a cruise this spring to the Mexican Riviera. I’ve traveled with Wesley before (to Iowa and San Francisco), but this will be the first time John comes with us. Our first bona fide family vacation! We’re stopping off in LA for a few extra days to visit John’s mom, and we got tickets for a taping of The Price Is Right. I also hope to hit the Getty Museum, the LA Farmer’s Market, take a walking tour of Hollywood, and maybe tour the Queen Mary. 9. We’re expecting an addition in August. Let me clarify that this shows two pictures of the SAME baby. Since I had four miscarriages in a row last year, ranging between 5 and 11 weeks, I was allowed to get an ultrasound at what was supposed to be about 6 1/2 weeks. It showed only an empty sack. When I was pregnant with Wes ultrasounds were these magical experiences that let me see and connect with our future baby. 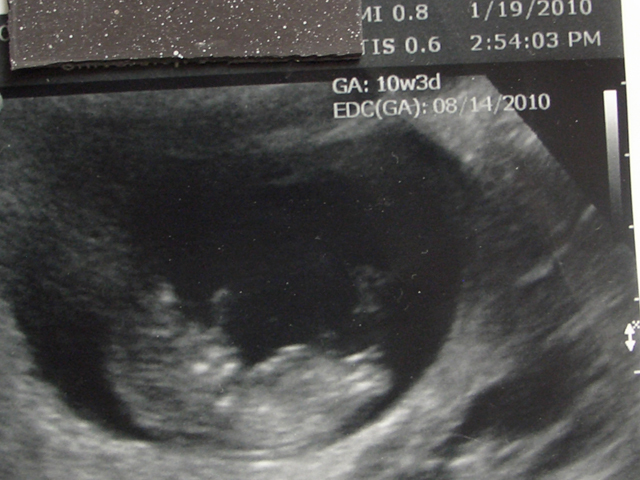 In the last year I’ve had so many ultrasounds I’ve lost track, and they were purely medical and very unmagical things–mostly checking on the progress of reducing uterine lining during miscarriage. So to see yet another empty sack wasn’t particularly unexpected nor encouraging. The technician told me to come back in two weeks to see if maybe our dates were just off. And heard a heartbeat. 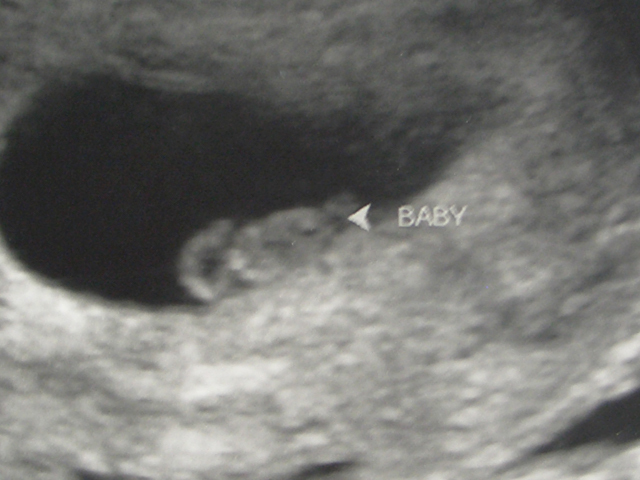 It was surreal–after SO many empty, silent ultrasounds–to finally see and hear something promising life. This little guy is 7 weeks and 2 days. It’s basically a yolk sac (on the left) and the body attached to it. This guy is about 10 weeks 5 days (even though it says 3 days). And has a heartbeat.